The FIA World Rallycross Championship presented by Monster Energy will resume after its summer break this weekend (4/5 August) with its first long-haul trip of 2018, to World RX of Canada at the popular Trois-Rivieres street circuit. Since the most recent outing at Holjes in Sweden at the beginning of July, the World RX drivers and teams have spent a month recharging their batteries in preparation for the second half of the campaign and a renewed push for glory. Trois-Rivieres has hosted high-profile international motorsport events since 1967, with the rallycross circuit – combining a section of the original street course with the nearby hippodrome – inaugurated in 2014. 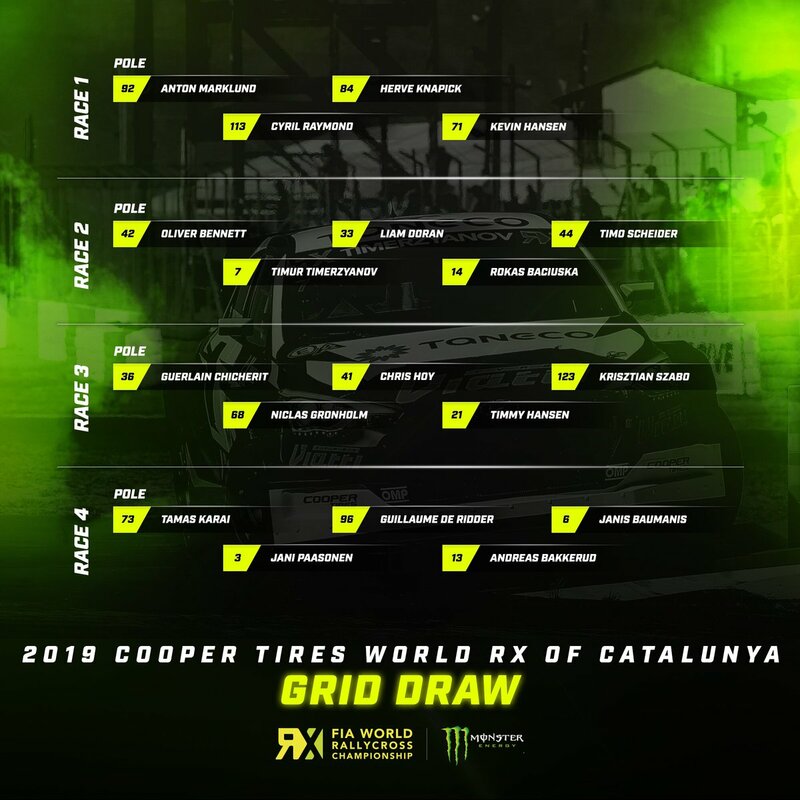 Defending champion Johan Kristoffersson leads the way as a 15-strong field heads across the Atlantic for round seven of 12, and the PSRX Volkswagen Sweden driver has form in Canada, having won there last year en route to his first World Title. The Swede returns as the man to beat, but with his rivals redoubling their efforts to rein him in, he will need to remain firmly at the top of his game if he is to maintain his current championship charge. EKS Audi Sport’s Andreas Bakkerud is Kristoffersson’s closest pursuer in the points table following a consistent run over the opening half of the season, during which the Norwegian made the final in every event and tallied a trio of podium finishes. He also placed second at Trois-Rivieres in 2016, so knows his way around the challenging 1370 metre track. Two-time champion Petter Solberg (PSRX Volkswagen Sweden), Team Peugeot Total’s Sebastien Loeb and Timmy Hansen and Bakkerud’s EKS team-mate Mattias Ekstrom are blanketed by just five points from third to sixth in the standings, and all four have reason to fancy their chances this weekend. Solberg won the inaugural World RX of Canada and returned to the podium there last year. Having seen his scintillating speed all too often undone by ill-fortune in 2018, the Norwegian will be determined to break into the winners’ circle for the first time this season. Loeb is sure to enjoy plenty of support from the partisan French-speaking crowd, while Hansen triumphed at Trois-Rivieres two years ago and has looked increasingly strong in recent rounds as – like Solberg – he bids to score his first victory of the campaign. Much the same can be said for 2016 title-winner Ekstrom, who can be counted upon to be a leading contender wherever the championship travels. Hansen’s younger brother Kevin will be behind the wheel of a third Peugeot 208 WRX and will be competing in Canada for only the second time, but the young Swede has been quietly impressive thus far this season and has reached the final in each of the last three events. GRX Taneco Team pairing Niclas Gronholm and Timur Timerzyanov have been going from strength-to-strength in the Hyundai i20 and both looked to be potential podium threats four weeks ago at Holjes before punctures scuppered their challenge. Notably, the Russian placed third at Trois-Rivieres in 2014. The World RX Supercar field is completed by Team Stard’s Janis Baumanis, Olsbergs MSE duo Robin Larsson and Kevin Eriksson, Gregoire Demoustier for Sebastien Loeb Racing and GC Kompetition team-mates Guerlain Chicherit and Jerome Grosset-Janin, with the latter having claimed the Renault Megane RS’ first trophy with third place in Sweden. As was the case at Silverstone in May, the World RX competitors will be joined this weekend by their Americas Rallycross Championship counterparts, including heavy-hitters of the discipline Ken Block, Scott Speed and Tanner Foust and former Formula 1 World Champion and Indianapolis 500 winner Jacques Villeneuve. The French-Canadian – who contested a part-season of World RX in 2014 – was born less than 200km from the track and is the son of the late Gilles Villeneuve, whose legendary exploits earned him hero status both in his native Quebec and all around the world. Trois-Rivieres was where Gilles made his name in Formula Atlantic back in the mid-1970s – and the springboard that shot him towards F1 superstardom.